It’s a funny thing about horses who can’t lose. Sometimes they do. Probably no horse had ever so resoundingly affirmed his invincible might than the mighty Secretariat had in winning the Marlboro Stakes in September of 1973. The Triple Crown champion took on the finest horses of all ages in North America that day, including the hardest hickory cracks of the handicap division, and snapped them like twigs. 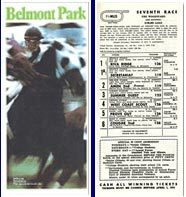 But two weeks later Secretariat would lose to a lightly-regarded 16-1 shot named Prove Out a horse not even good enough to be invited to race against Secretariat in the Marlboro. Some said it wasn’t the horse, but the magic of the horse trainer that made the upset. It was trainer Allen Jerkens who had sent out Onion to upset Secretariat at Saratoga in August, and now it was Jerkens sending out an even less-likely challenger to beat the Big Red Horse again. Whether it was the trainer’s magic, or the luck of horse racing, or simply a flaw in Secretariat’s personality that left him less interested in modest challenges than big ones well, that’s something racing fans will always debate. 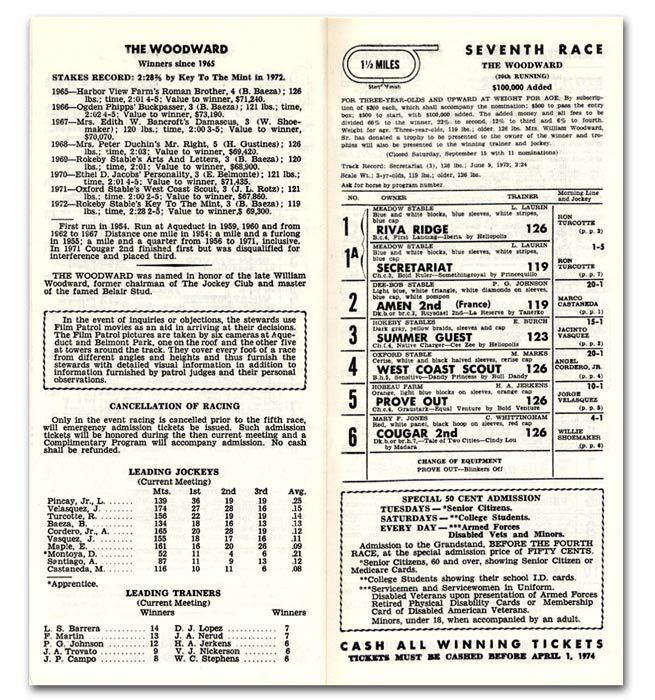 But the fact remains that in the 1 ½ mile Woodward Stakes at Belmont, a 16-1 shot did beat favored Secretariat and beat him pretty easily. Following the winning style employed previously by Onion, jockey Jorge Velasquez sent Prove Out to an early lead in the Woodward, looking to go wire-to-wire against Secretariat. Meanwhile, not wishing for lightning to strike him twice, Secretariat’s jockey Ron Turcotte snatched the lead for himself on the backstretch. But in the stretch, Prove Out came back to pass Secretariat and grab the win by 4 ½ lengths. The race was strictly between those two it was a distant 11 lengths back to Cougar II, who was along for third. According to the notes made by the Chart Caller for the Daily Racing Form, Prove Out claimed the lead at the start and hugged the rail heading into the first turn, of the two-turn race at huge Belmont Park. (The track is 1 ½ miles in circumference, and one around, starting and finishing at the finish line makes the route.) Prove Out, the trackman said, “was unhurried when replaced (on the lead) by Secretariat soon after entering the backstretch, moved to that rival while continuing along the inside nearing the stretch, and drew off when roused sharply leaving the furlong grounds.” That last is racing jargon for shot ahead when cracked with the whip halfway down the homestretch. For any other horse, a second in a $100,000 mile-and-half stakes race in Belmont Park would be considered a good performance. But good wasn’t good enough for most fans of Secretariat. It was hard loss for some to take. Thirty years later, Jerkens still has the nickname, and the same reputation for springing upsets in big races. As for Secretariat, the beaten champion would return to do battle another day.